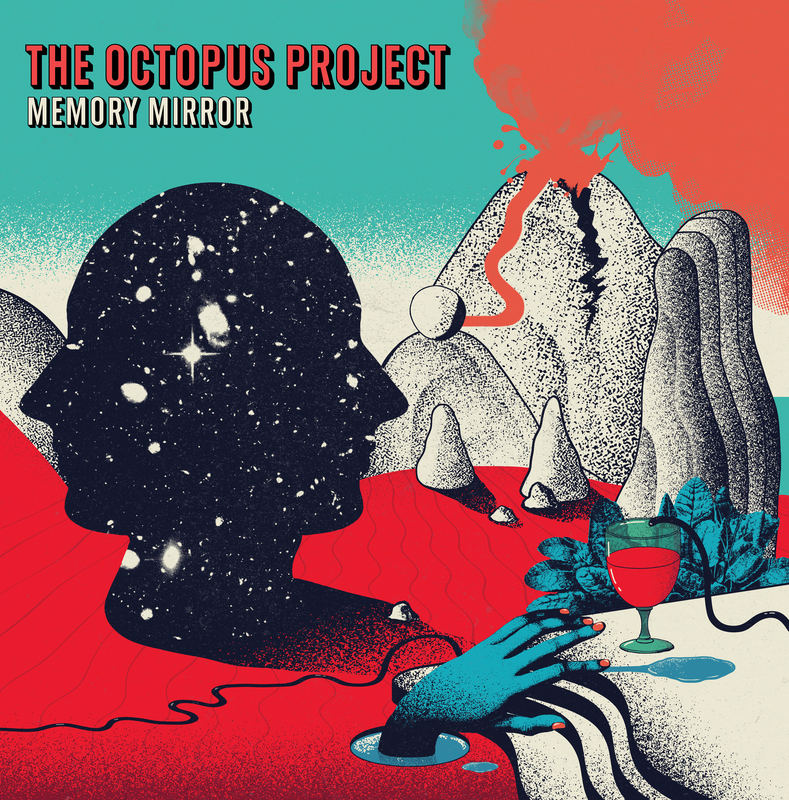 The Octopus Project has been releasing joyous party music since 2002, following a musical path that veers through blown-out rock’n’roll, vibrant electronics, surreal pop and expansive psych landscapes. All these complimentary/contrasting elements have been packed into their sixth and latest album Memory Mirror, creating a sonic world that is at once more diverse and more focused than any of the band’s work to date. Writing and recording the album were aspects of the same process, with inspiration coming from sounds, accidental textures and rhythms that would then be shaped into songs. “Small Hundred,” for example, was born out of a recording of a champagne cork popping at the end of a European tour. That sound – distorted, pitched, and played as a rhythmic sample, became the arpeggiated rhythm that drives the song’s wordless chorus. The stuttering keyboard pads on “Pedro Yang” came from a previous, failed synth composition – when it was arbitrarily chopped up and rearranged, the new rhythms that emerged suggested a slow-motion float that the song came to embody. The real fun, though, lies in marrying these abstract inspirations to beats and melodies that reach out and grab you. The looping sequence that runs throughout “Woah, Mossman! !” may be in 10/4 (we think?) but it’s the insistent backbeat and rising vocal refrain that get stuck in your head. Memory Mirror also represents a more focused approach to instrumentation and arrangement, in contrast to the heavily layered style explored on some earlier albums. Though the songs range from blasting guitar rock to blissed-out ambience, each has a sense of space has allowed the band to pursue heavier sounds and wider vistas than ever before. A nose-puncher like “Cuidate” blasts out of the speakers no matter the volume, while “Remember Remembering” with its soaring Theremin choir and “Ledgeridge” with its serpentine synth finale transport the listener to another world. Though the album was primarily self-recorded at home, the band was thrilled to get work with two incredible engineers, Dave Fridmann (Flaming Lips, Tame Impala) and Danny Reisch (Shearwater, White Denim) in the mix process. In early 2016 they eagerly accepted an invitation to work with Fridmann at Tarbox Road Studios in Western New York. With the album only partially written, Fridmann would spend the day mixing a completed song, while the band availed themselves of the extensive studio facilities and instrument collection to work on the remaining tunes. Coming out of that session with a stellar mix of a partial album, the band returned to their hometown of Austin, TX to finish writing and figure out the next step for the record. That next step turned out to be Danny Reisch, who stepped in as mix engineer and worked closely with the group to craft the remaining songs and shape the album into what it ultimately became. The result is an album that features the band’s DIY recordings enhanced and augmented by two of their favorite sound wizards and fellow ear-candy enthusiasts, and they are very very stoked about it. Enjoy! The Octopus Project is Toto Miranda, Yvonne Lambert, Josh Lambert and Lauren Gurgiolo. Based in Austin, TX, the group of multi-instrumentalists has released six albums, starting with 2002’s Identification Parade. Touring clubs and festivals worldwide both on their own and as handpicked support for artists as diverse as DEVO and Aesop Rock, they’ve earned a reputation for explosive live shows and immersive audio-visual experiments. Also active as composers for video games and film, they were awarded the Special Jury Award for Musical Score at the 2014 Sundance Film Festival for their work on the film Kumiko, the Treasure Hunter. The band is currently at work on a score for Damsel, starring Robert Pattinson, now in post-production.